These are made with both dark chocolate and cocoa powder for a decadent chocolate flavor. Suddenly, it hits you - a little zing, bing, ba boom to liven up your dessert. Stir in sugar, brown sugar, coffee, buttermilk, and water. Sift flour, cocoa powder, and baking soda into chocolate mixture and gently stir to combine. Grease a 9" square baking pan and pour in the batter, spreading it out as evenly as you can. 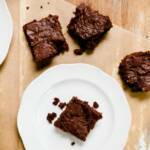 Bake for 30 minutes or until a toothpick inserted into the center of the brownies has just a few crumbs on it. The toothpick should not be totally dry. Cool to room temperature on the counter before cutting.